Take a stroll around any of Tokyo’s cultural and entertainment centers; longtime residents of the city will notice a distinct rise in the number of travelers from abroad that are flocking to the nation’s capital. According to the Japan Tourism Agency, a whopping 19.73 million people visited the country in 2015, marking the first time in almost half a century that the number of inbound travelers surpassed the outbound figure. And sure enough, the number of people who have decided to take the leap and learn the Japanese language has accordingly gone up, too. Indeed, the number of students from abroad enrolled in Japanese language programs rose 13.2 percent in 2015 from the previous year, according to data from the Japan Student Services Organization (JASSO) released this March. According to JASSO, a record 208,379 students were enrolled in programs nationwide as of May 1, 2015. But why are more people making the choice to visit Japan? The factors behind the nation’s rise in popularity — not just as a tourist destination, but also as a potential country of residence — can be accounted for with a plethora of reasons. 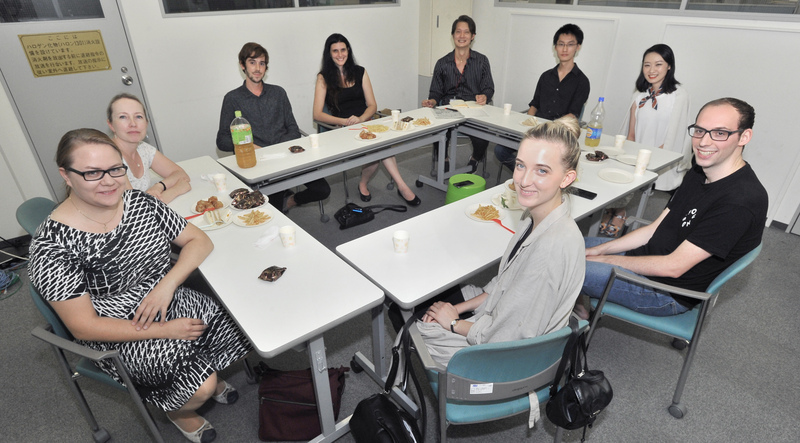 The Japan Times spoke with eight students, in Japanese, who are currently enrolled in language programs in Tokyo to ask them their motivation for studying Japanese, what drives them to continue and how they plan to use their newly gained language skills. When I was a child I watched a lot of anime, and I had many friends that were into it, too. “Death Note” was a big hit for me. Now, I speak Japanese every weekday in my intensive course, and trust me, that’s enough! On weekends I go out and try to speak with as many people as I can. Sometimes I find myself surrounded by only Japanese-speaking people — it’s tough, but I like the challenge. And when it comes to kanji, I really like the kanji “taberu,” (eat). It’s part of my culture. I used to be a computer engineer, but after one and a half years in Paris I decided to come to Tokyo to discover something different. Now, I’m thinking of working at a startup in Tokyo, or maybe Osaka. And engineers in Japan don’t speak that much English! I first experienced Japanese culture when I was really young, through Pokemon on TV in Sweden. I didn’t even realize it was from Japan, but was really into it. And in high school I thought I’d study something different from most of the other students. After starting Japanese, I came to think that Japanese kanji was beautiful to look at. I personally like the kanji “tobu” (to fly). I don’t like planes, but I like the kanji! I wanted to come to a different country to experience a different way of life. My main aim now is to improve my Japanese, but I also want to make more friends to speak more Japanese, as well as other languages, too. I love art and traveling, so something that combines them and the Japanese language would be the dream. Just like Sofia, I had my first Japanese experience through Pokemon and other anime. I came to Japan because of church-related activities, so during the weekends I speak Japanese with people at my church. The people around me say that my Japanese is improving, and moreover I can feel the improvement, which is a good feeling. I had plans to work in Japan from the get-go, and my job is to listen to people’s problems — kind of like a counselor — so I want to have deeper conversations. I think it will take time, but I’ll be in Japan to do it. When I was younger I thought that Polish TV was really boring and, after watching “Shogun,” I developed an interest in Japan and its culture. Years later I had a friend who studied abroad in Japan, and she invited me to visit her, and I thought that it was the chance of a lifetime. I thought about it for 10 minutes and decided to come. I’m an English language teacher now, but I want to do something else, which would require Japanese. I want to have a change in my life, but I’m not sure what that is yet. I’ve been doing ikebana recently, so becoming an ikebana teacher would be nice, even thought it may take decades! I first heard the Japanese language in junior high school and I thought it sounded beautiful. Complex, but beautiful. I study on weekdays like everyone else, but I’m in a bit of a dangerous situation; I live with people from other countries so I speak too much English! At first, studying the language was just a hobby, but when I got into university I started to study law, and thought it would be good to be able to use Japanese in my future work. I wanted more experience here in the country and now I’ve ultimately been able to find work in a law firm here. I love Japanese TV dramas; I used to watch them with my grandmother. I studied journalism in university, and now I want to do my master’s here in Japan. I even wrote about (the TV drama series) “Long Vacation,” starring Takuya Kimura. I like the storytelling in Japanese shows, so I wanted explore that further. I want to stay in Japan and work in TV production. When I came to Japan I realized that what I wanted to study was here. I don’t like mass media in China, so I never watched TV. I think there are issues with Japan’s media too, but it feels like there’s more of an effort to encourage change, as opposed to back home. I’m older than the Pokemon generation. Even as an adult, I still didn’t have an interest in anime. I work at Haneda Airport, and I speak Japanese all the time. The airport is busiest during the weekends so I study mostly during weekday evenings. Sometimes I’m so busy that I don’t want to hear any more Japanese! I used to conduct research related to the brain, but it was difficult to find work in France, so I came here. 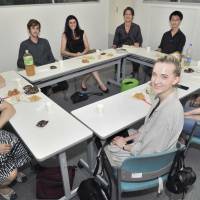 I’d like to continue my research here in Japan, and learn and share my research concepts. After high school I entered university, but I didn’t enjoy my studies so I came to Japan. I thought the schools here were nicer than back home, but the studies were tough. I’m going to continue studying until the end of the year, and then I’ll see how high my level is. If it makes the cut, then I’ll stay in Japan and study more — and try to find work. If not, I’ll go back home and back to school. But I want to stay in Japan. I love karaoke.